A certain scorpion, wanting to cross a river was scuttling about on the bank, looking for a means of getting to the other side. Seeing his problem, a tortoise offered to carry him across. The scorpion thanked the tortoise, and climbed on his back. As soon as the tortoise had finished his swim and unloaded the scorpion, the scorpion gave him a really powerful sting. 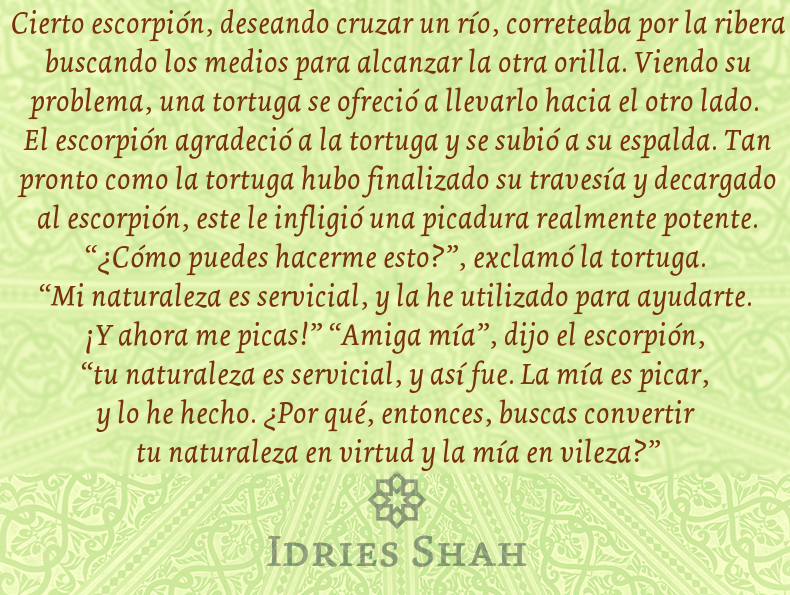 Esta entrada se ha publicado en Cuentos, Estudio, Idries Shah y se ha etiquetado como Idries Shah, The Commanding Self. Marca el vínculo permanente.